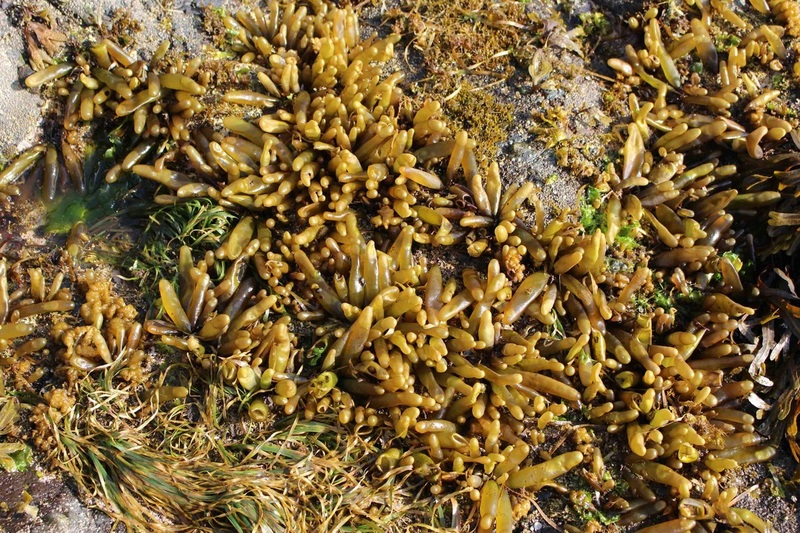 Sea sacs found on Calvert Island beaches. Photos by Sara Wickham (right), Gillian Harvey (bottom left), and Kelly Fretwell (top left). Resembling clusters of inflated rubber glove fingers, the name 'dead man's fingers' is highly descriptive of this red seaweed's shape. Sometimes the "fingers" will be deflated, but usually they are filled with water. This species varies in colour from purple-red to yellowy-green or brownish. While it can reach 30 cm tall, it is more commonly found at half that size or less. The 'fingers' attach to rocks via small disc-shaped holdfasts. 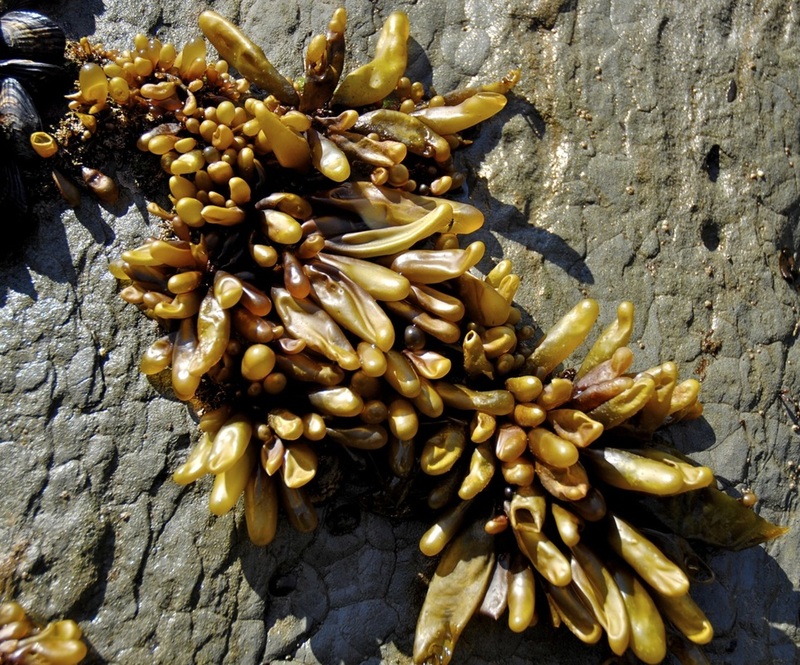 This species usually grows in clusters on rock in the mid- to low intertidal, on exposed and semi-exposed shorelines. Its range extends from the Aleutian Islands to California. In Marine Life of the Pacific Northwest, Lamb and Hanby point out that these water-filled sacs can be quite successfully used as water pistols. When squeezed, the water inflating the sac escapes from tiny pores. The long and narrow water-filled sacs protect the species from the high-energy waves it encounters in its habitat, as well as from desiccation during low tides and on hot days. 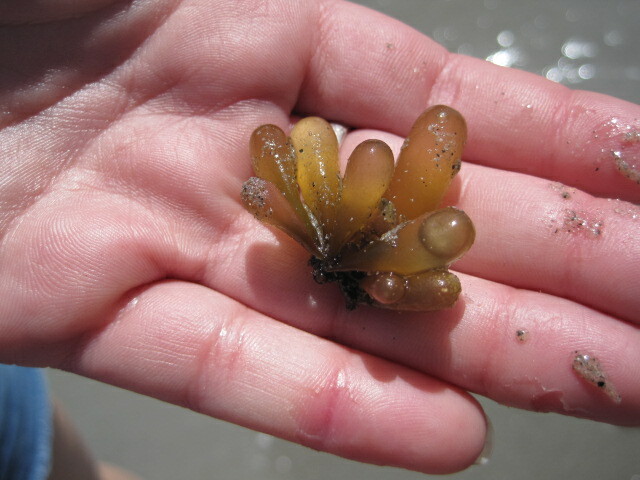 Sea sacs are commonly eaten by limpets and black turban snails, and the interiors of the sacs are used as shelter by creatures such as amphipods and microscopic nematodes. Harbo, R. M. (1999). Whelks to whales: Coastal marine life of the Pacific Northwest. Madeira Park, BC: Harbour Publishing. P. 208.